Argyle Pink Diamonds from I Got Your Silver Lining (IGYSL) Fine Jewelry when only the best will do. Featuring Investment Grade Gems, Free Shipping, Personal Shopping Concierge., Appraisals and Gift with every purchase. Every transaction is also Risk Free with our 30 day no hassle return policy. From our custom 'IGYSL Collection', this 'Argyle Fancy Pink and Colorless White Diamond Ring' contains over 1 and 1/4 carat of Fancy Pinks from the Argyle Mines in Australia, surrounded by 3/4+ of crystal clear white diamonds! All diamonds have excellent clarity, which is quite unusual for Fancy Colored Diamonds on the market today. 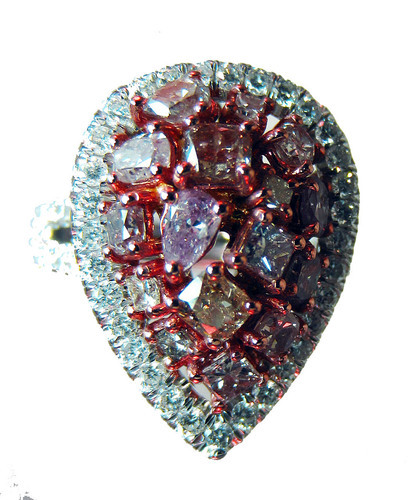 Natural Color Pink diamonds have grown 443% over the last ten years! Here's your opportunity to make a smart financial investment and a very special and lovely piece jewelry at the same time. Compare at top name Design houses for $30K+. Retail List: $16,504. IGYSL List: $7950. On Sale: $6500. Stunning piece...do not want to take it off. Click the button below to add the Argyle Fancy Pink and Colorless White Diamond Ring to your wish list.